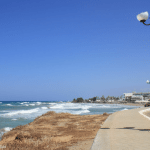 The holiday resort of Gournes lies just 15 km from Heraklion airport and is a short car or coach ride from the airport usually only taking 20 minutes. The village of Gournes lies next to the village of Gouves and Kokkini Hani and is a wonderfully idyllic village perfect fro quiet relaxing family or couples holidays. 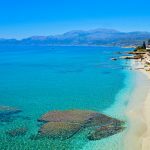 The village has some excellent hotels and apartments and a few bars and restaurants scattered around but the village never seems too crowded or busy and retains the Greek charm and friendliness you expect when visiting the Greek islands. Visiting the seafront of Gournes brings you to a large man made sandy beach and a small harbour where you can catch boat trips out to Dia island which is perfect for snorkelling, alternatively you can take fishing trips around the coast. 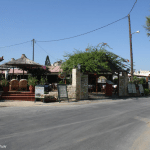 If your looking for a quiet and peaceful holiday then Gournes is for you, the village holds some excellent cafes and Taverna’s and the beach is never too crowded. The beaches or Gournes are varied with some sandy beaches and shingle beaches. The island of Dia is a nature reserve and one of the few places you will see the Kri Kri goats native to the island of Crete. There is also a small lost village just out from the bay of Dia and you can snorkel around the area. Note though that taking artefacts including broken pot and jar pieces is forbidden and must left on the island. The island of Dia and back in Gournes is the perfect place if you want to go snorkelling and you will see many an Octopus and eel if you keep your eyes open. There are a few shops in Gournes mainly selling local produce like fresh honey, herbs and locally produced wine and Raki. 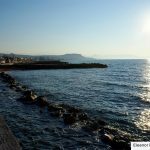 Although you will find more shops in Heraklion and Hersonissos, both of which are just a euro of two bus trip from the main road. If you want to explore the local area you will find the church of St. John Beziti, just outside Gournes, this church is well worth seeing for its well-preserved frescoes and gold artwork. Our personal favourite although technically not a recognised sight in Crete is the old American Naval base, its been left to fall into disrepair and you can get some great pictures of the old airfield, bowling alley and fire station. If you have brought the family with you on holiday then you need to visit Watercity at least once, its an amazing Waterpark just up the mountains past Kokkini Hani and the entrance is well priced and the facilities at the Waterpark are top notch. 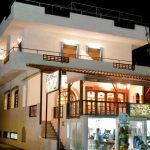 You can also visit Crete Aquarium which has been built quite recently just past the old American naval base and the aquarium houses all the native fish from the seas around Crete and is a great day out for you and the family. Gournes has a few bars and discos although the nightlife is not over the top or loud, its perfect for relaxing and enjoying the atmosphere and every bar welcomes families, couples and singles alike. The hotels of Gournes normally provide entertainment and its advertised within hotel grounds or you can find information for your representatives. Also offered is a traditional Greek night up in the Anopolis mountains just past Kokkini Hani, the Greek night consists of all you can eat buffet of traditional Greek food, free flowing local red and white wine and a night of traditional Greek dancing. This is one of the best nights available on the island and normally comes in about 30-40 euros per head. 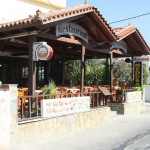 If your looking to eat out in Gournes then you have a wide range of Taverna’s or restaurants at your disposal, with traditional Greek Taverna’s offering up some excellent home cooked dishes including Stifado, Moussaka and more. If you have brought the family then we recommend trying the Greek meze which is normally small plates of various dishes including fish, squid, meats, stuffed vine leaves and more. The plates may be small but you get so many choices that you will soon be full to bursting. Children are normally well catered for with small portions and simpler food for the less adventurous child.